Programming the MPFI (ACM) is done using a simple USB based programmer that is available from White Oak Audio Design (pictures are available on the Product Gallery page). The programmer plugs directly into the MPFI interface connector and takes less than 10 seconds to update the MPFI. It has a simple to use programming tool (shown below) and GUI interface that is based on the Microchip PICKit2 programmer. Injector tuning is done using a Windows based application program. 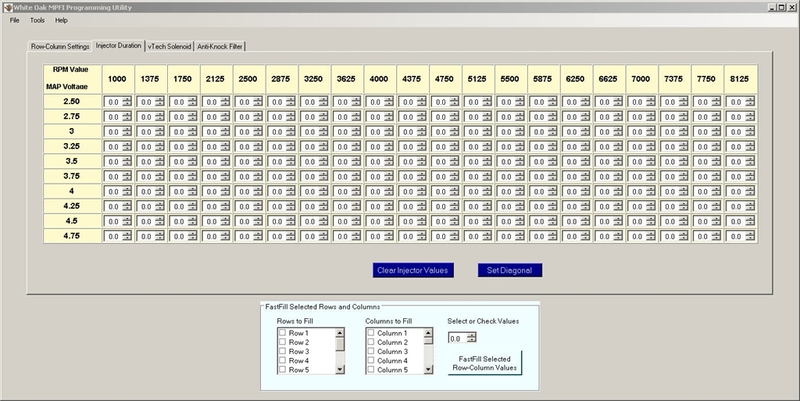 The MAP vs. RPM table allows 20 distinct column entries for RPM values ranging from 1000 to 9000 RPM and 10 MAP row entries ranging from 1 volt up to 4.95 volts in user selectable ranges. All parameters tunable by the user. A single button click (the LIGHT BLUE one labeled "Program MPFI") programs the MPFI with the program that the user just developed. The Excel based programming utility is still available and supported.